ANCIENT CARP: WHAT DO WE REALLY KNOW? ARE CARP THAT LENEY STOCKED ONLY MIDDLE-AGED? IT is possible that “the long common” still being seen in Redmire Pool from time to time is the same fish that was reported by Walker, Ingham, Hilton, Yates and others; and it is also possible that this fish is no more than middle-aged! A fishing acquaintance saw the fish last year: and I believe his account of a carp of between 3ft 6 inches and 4ft long. If it is the fish that Yates called “The King”, it is likely that the carp was either stocked into the pool as a one or two year old by Leney in March, 1934, or it was born in the pool shortly afterwards. This would make Redmire’s big common almost eighty years of age, at the time of writing (2013). My friend, however, the chap who saw the fish, is having none of this; and he believes that the uncaught giant is a young carp: one that has simply won the lottery in the gene pool stakes. I must respect his view, and realise I have made some outrageous claims, for which there is precious little evidence! However, I shall attempt to stand my argument up, with an awful lot of “maybes” and conjecture, if only for the sake of gentle and thought-provoking entertainment. 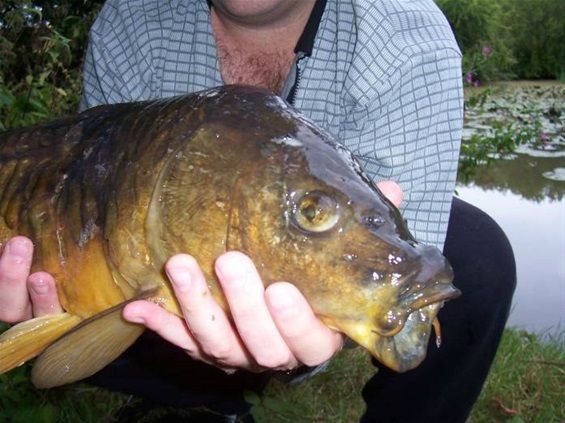 Firstly, it is accepted that the oldest recorded carp in Redmire was the sparsely-scaled mirror, Raspberry. This was a well-known carp, one that was landed by John Nixon in June, 1961. It is conjectured that this fish was one from the original stocking, and it was widely accepted that, at the time of its death in 2009, the fish must have been well over seventy years of age. Its status as an original stocked fish, of course, cannot be substantiated beyond doubt; but if we accept that, when Nixon caught it, it must have been a fully grown fish, then Raspberry cannot have been born later than, say, 1946 – making her at least 63 years old at the time of her curtain call. This is because the skeletal frame of a carp grows for a period of around 15 years, before it stops. The growth rings on the scales, we now know, merely show the period of this skeletal growth, and not the actual age of the carp, over and above 15 years or thereabouts. How do we know this? Well, we have Clarissa, the former record carp, to thank for this insight. In his paper of 2000, “Can Fish Outlive Anglers?” Dr Bruno Broughton says of Clarissa: “Scales taken at the time of capture (1952) revealed that the fish was aged 15 years. However, another scale reading, after its death, showed there to be between 13 and 15 growth checks on the scales. At her time of death, in 1971, Clarissa could have been around 38 years of age – assuming she was a one or two year old stocked by Leney in 1934, which is not certain. So, there we have it: some evidence that carp, at least Leney carp, can live to reach reasonable ages, - to at least, perhaps, anywhere between 35 and 65 years of age. However, it is worth recalling that Clarissa was an out-of-condition fish in London Zoo Aquarium at the time of her death, and Raspberry had been a carp in distress, - often seen on the surface, shortly before she was found dead. In other words, we are using a captive fish and a poorly fish as evidence for the longevity of carp, and this is surely fraught with dangers. Human beings do not usually thrive in captivity, and we can also sicken and die before our time: just like fish. Could it be that Raspberry died not because she was old, but because she suddenly fell ill? What evidence is there, then, for the possible longevity of carp? In his engaging book, “Aphrodite’s Carp”, John Langridge supplies this fascinating information: “In the Orient, a red koi known as Hanako, in Gifu, Japan, was said to have survived a number of its owner’s family generations and to be at least two hundred years old in the 1960s. A koi carp, of course, is merely a variant of cyprinus carpio, and while we are talking about “well-kept fish”, the statement is still most interesting. After all, Clarissa herself did not do well in captivity: her weight was down from 44lb on arrival to less than 26lbs at the time of her demise. Could it be, then, that carp actually have the potential to live longer in the wild? If, based on the information from koi breeders, we assume that an age of 100 years is easily possible for carp, then this has implications for Redmire Pool and other well-established carp lakes. If we make another assumption that the long common, seen clearly on one occasion in 2012, was a two year old fish at the stocking in 1934, then by now it is indeed almost eighty years old, and it may have more than twenty years to live. However, pointing to the example of “Hanako”, we might make a fair claim that 200 years is the upper limit for a carp, - making the uncaught Redmire giant no more than middle-aged, at most! So how large would a Leney common be of that length, assuming the fish is of sturdy proportions? My “port by the fireside” estimate - based on the apparent condition factors of Clarissa when caught - would be anywhere between 51lbs and 63lbs. With spawn, of course, the total could be 20 per cent higher! Pictured above - this ancient warrior was caught from a lake reputed to have been stocked by Leney in the 1930s. There is no mistaking the signs of age with this mirror. But the question remains, - how old?